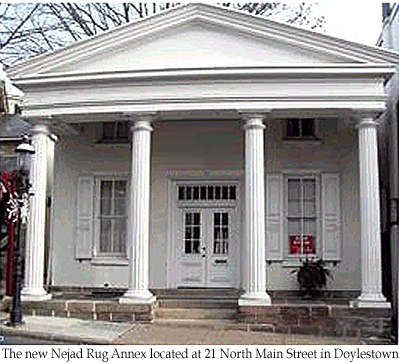 Nejad Gallery Fine Oriental Rugs in Doylestown is expanding its showroom space to include the historic Greek revival building two stores down at 21 N. Main St. The building will showcase the gallery's inventory of handmade hall and staircase runners and hard-to-find shapes and sizes, including rounds, squares and runners. Theresa Nejad and her design team have been creating rug collections for many years and selling the designs to high-end retailers across the country and internationally. The additional space will provide room to showcase these rugs in addition to many one-of-a-kind and antique rugs. The Nejad Gallery Annex is scheduled to open Friday, March 15.